This cache is a 1 litre white plastic freezer box with the traditional log book, pencil, etc, and room for trade items. It is easily accessible and available throughout the year. Tämä kätkö on valkoinen 1 litran pakasterasia, sisältäen tarvittavan lokikirjan, kynän jne, ja myös tilaa vaihtotavaroille. Tavoiteltavissa helposti kaikkina vuodenaikoina. 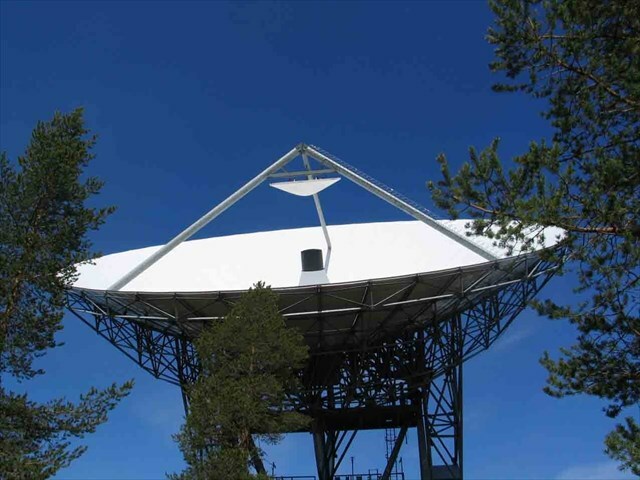 ‘Watch this Space’ is located close to the main building at Tähteläntie, which has been the home of the Sodankylä Geophysical Observatory, now part of the University of Oulu, since 1914; the site is also shared by the Finnish Meteorological Institute. The antenna 150m to the south is operated by the Observatory on behalf of the EISCAT Scientific Association and is part of a large ionospheric research radar. The radar, together with a number of others around the World, is studying the upper atmosphere to learn how the material blown off the Sun by activity at the solar surface interacts with and affects the Earth and our own environment. This radar site is a receiver working together with a transmitter located near Tromsø, in Norway, and another identical receiver located near Kiruna, in Sweden. There are presently no other tri-static radars like this in the World. Important parts of the work of both the Observatory and EISCAT relate to processes taking place in space, between 1-400km above our heads, where particles from the Sun cause the fantastic spectacle of the Aurora, hence the name of this cache (though you will need to avoid visiting in the summer, when the sun never sets, to have a chance to see a display). You can find lots more information about the Geophysical Observatory at www.sgo.fi, about the Meteorological Institute at fmiarc.fmi.fi, and about the EISCAT Scientific Association at www.eiscat.se. Here We can "Watch this Space"